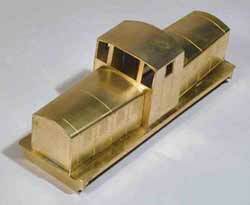 Worsley Works has recently added to its range of Scratch Aid' etched brass body kits in 4mm scale a Walker centre cab diesel loco as supplied to the 3' gauge West Clare Railway in lreland. These locos were fully described, along with a scale drawing, in RM June 1985. and can also be found in our Modelling the lrish Narrow Gauge. The kit provides the mainframe, solebars, buffer beams, bonnets and cab. The modeller must supply the mechanism. With our sample, a second sheet was provided with replacement bonnet etches - necessitated by a dimensional error in the originals which prevented a proper fit. We imagine production versions of the kit will only have the one sheet. The extra sheet also included alternative radiator grill end panels either perforated sheet or open mesh: the latter is delightful but so fine as to be very delicate. To simplify production and keep the cost down, as usual the kit does not include gazing or any interior detail, the couplings, or the fixing nuts and bolts, and there are no 'solid' details as castings. The builder must also supply wire for handrails and door handles, though the fixing holes are present. The instructions are simple enough, basically covering the assembly of the components supplied, assuming - not unreasonably for something that is sold as an aid to scratch building rather than a complete kit - that the builder will be familiar with the techniques required. It also presumes the builder will have access to drawings and photos to complete the detailing as appropriate. Once again Worsley has provided a good basis which wiII take a lot of the hardest work out of modelling these machines.